The top of the window looks like this. The Rakontu's picture is at the left; the member's picture at the right; and drop-down menus in the middle. 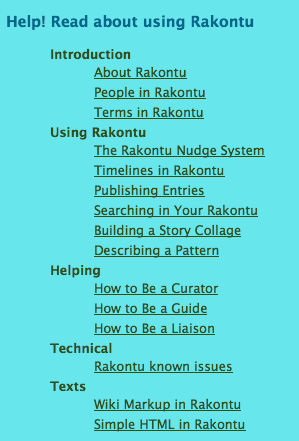 Here the member looks at the Rakontu's home page, where stories are shown in a timeline. 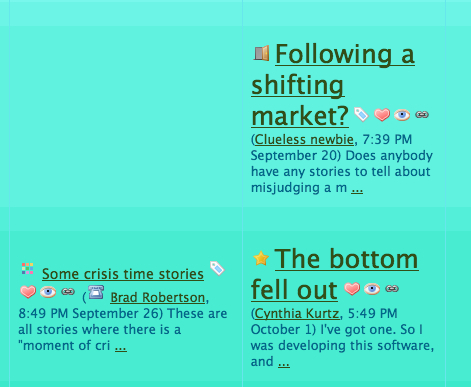 Recent entries are to the right; entries nearer the top have been "nudged" (rated) higher; and larger-font entries have had more activity around them. Here details are turned off so only titles are showing. The member turns on details and sees (in this excerpt) one collage, one invitation and one story. The little icons after entry names represent annotations to the entry. The member looks at the view options available. They can choose which types of entry to look at (besides stories there are invitations, collages, patterns and resources); which nudge categories to consider in the vertical placement; and a search filter to apply. Here the member sets the "nudge floor" low, and a spam entry appears, which has been nudged down low and flagged for deletion (see the little red flag?). 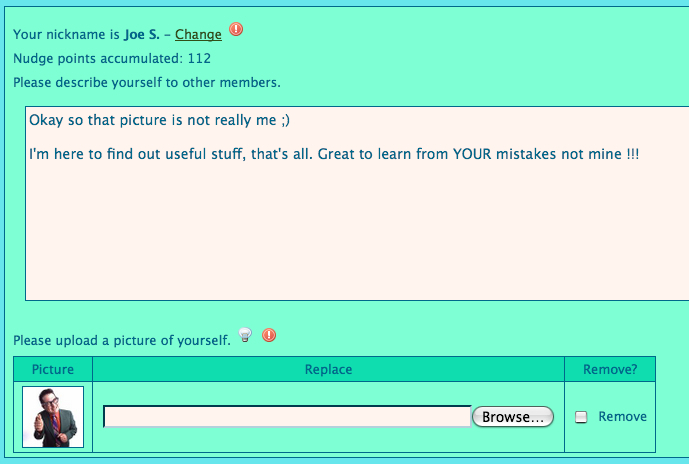 The member clicks on an entry and reads the text of it. 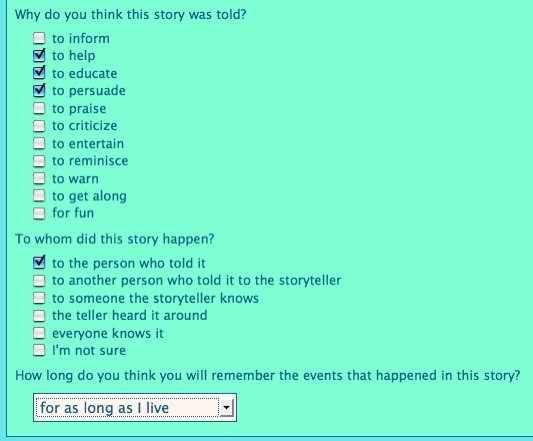 For this particular story they can see that it was told because another story reminded somebody of it. There are some things the member can do with respect to each story (or other entry). 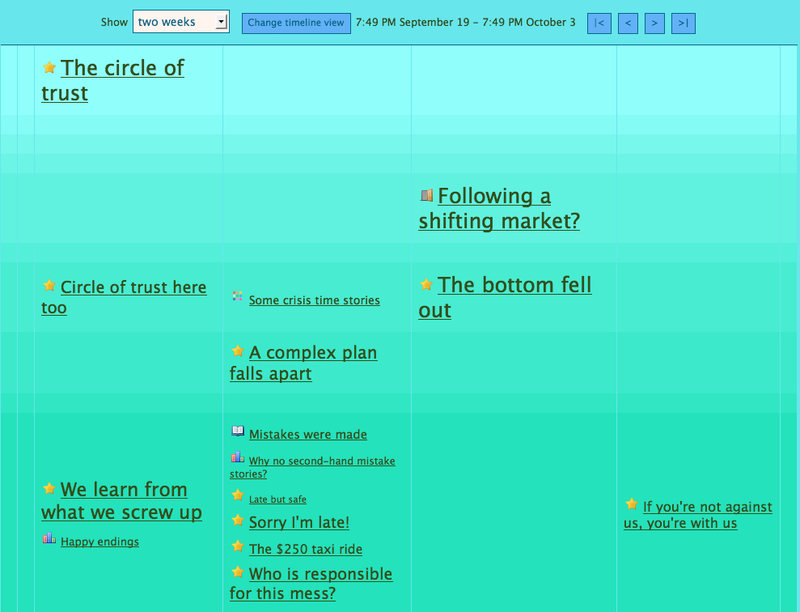 Here is a timeline of annotations to the story. 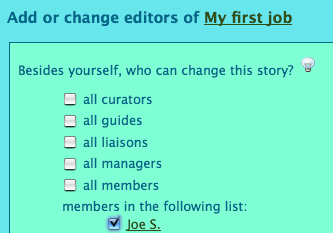 They can change what types of annotations they want to see. 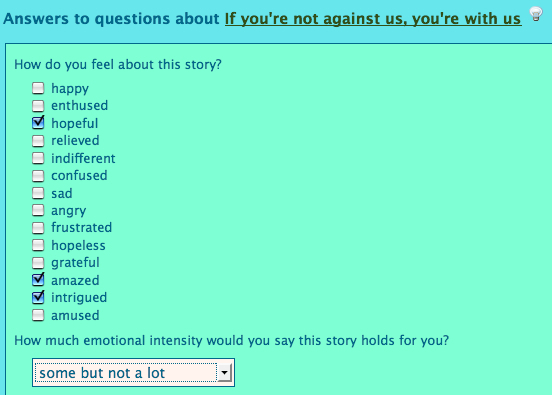 The member answers some questions about somebody else's story. Next the member looks at an invitation. 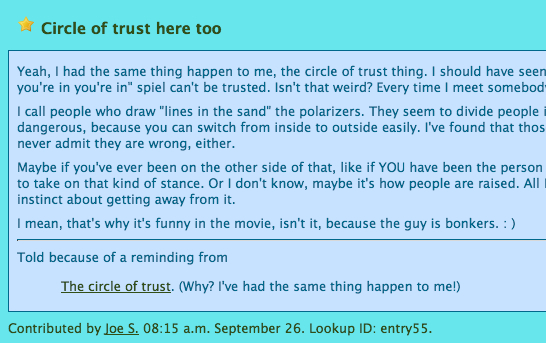 Here the member is nudging a pattern. Note how they can positive or negative points in all nudge categories (which should be meaningful to the group, if the managers set it up well). Also note the little information and caution icons. These are found throughout the system and give tips and information. 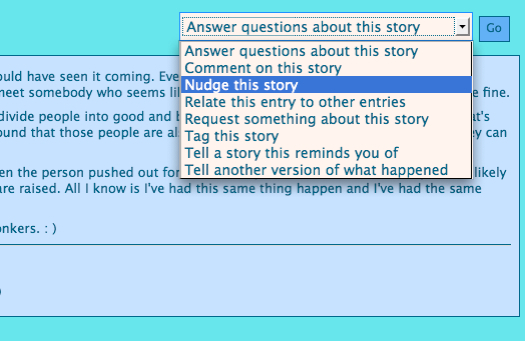 They build a search filter to look for some specific stories they'd like to read. Now the member is ready to tell a story. They answer some questions about their new story. They save it as a draft and make multiple versions of it. They decide to let another member share editing of the story. They read about the group. They read about fictional characters they can use to tell stories without admitting their mistakes. 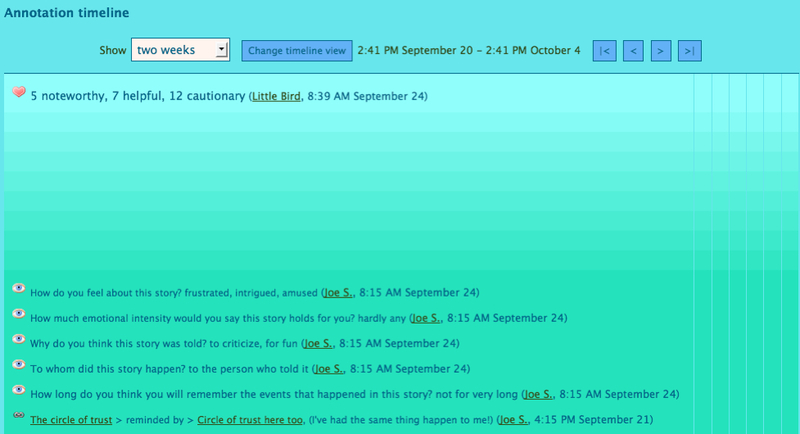 They look at one character's page to see what sorts of stories "Old Coot" has told. Now the member decides to change their profile. They answer some questions about themselves. They look at the profiles of other members. 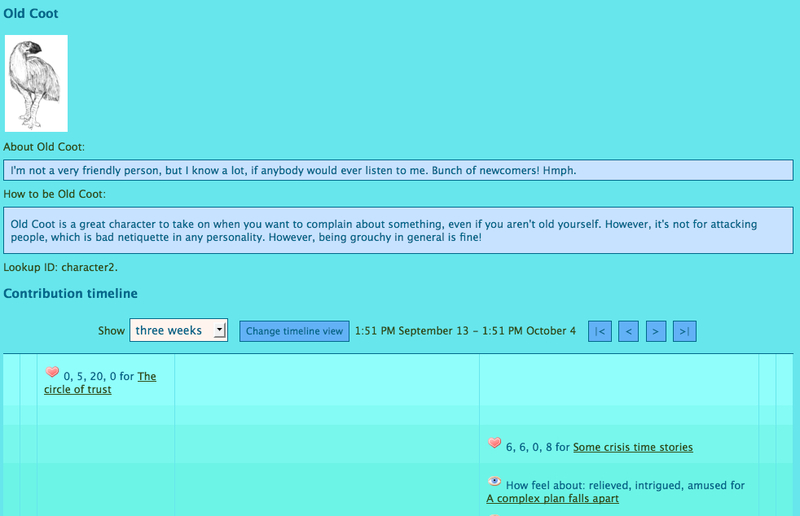 For more screenshots see the pages about helping roles, managing, and administering.